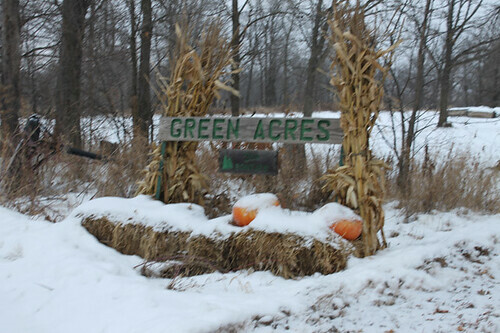 Last Sunday I headed up to Pine City, Minnesota to visit Wayne Bontjes of Green Acres Farm. Pine City is 2 hours North of us. We’re an hour south of the Twin Cities, they’re an hour North, half way between the Twin Cities and Duluth. Wayne has a spread that I’d guesstimate between 20-40 acres, it was a bit hard to tell with all the snow on the ground. It’s really quite flat there, that’s probably the case for most of the state. I consider us lucky in that reguard, the Southeast part of the state has more rolling topography, moving toward bluff-country as you approach the Mississippi river. 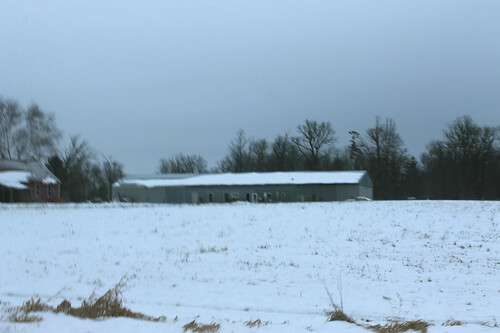 The biggest outbuilding is this former dairy-barn (not a terribly old one) that Wayne has converted for use in his pig operation. I found Wayne on craigslist when I was looking for Large Black hogs. He wasn’t selling any, but he was raising and selling Tamworth, Berkshire and Large Black pigs as market hogs. I was pretty interested to see the farm since they have the same type of hog operation that I envision having on our farm someday. 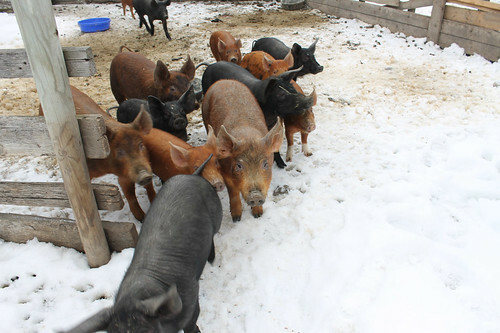 I’ve been curious about how to keep pigs warm in the Minnesota winters, and as luck would have it, it’s winter now, and with Green Acres Farm being 2 hours North, it’s even colder there than in Zumbrota. 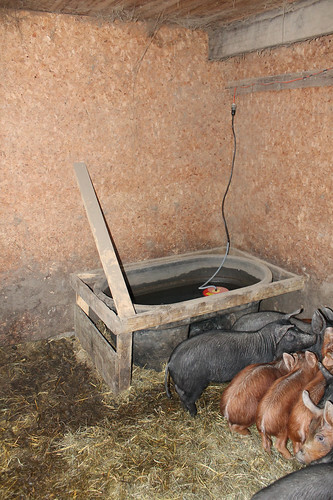 Whatever Wayne does to keep his pigs comfortable in the winter will probably work for me. As it turns out, I didn’t have much to worry about. 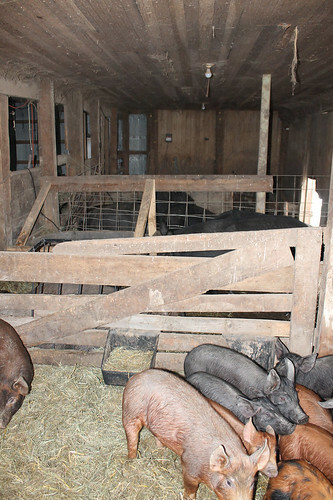 There were three different pig pens in the barn, each with their own outdoor run. It looked to me like this part of the barn used to be dairy cow stalls, and that they just took down a partition between two (or three) stalls to make one pig pen. The little pigs had plenty of dry hay on the floor to lay down in and that seemed to be enough to keep them happy. When they figured out we weren’t going to feed them they just piled up in a corner on the hay and hung out. Getting the water situation right for the winter is apparently the hardest part. Wayne was sold on the combination of these $150 plastic tanks and a sinking tank de-icer. Waynes boar has been hard on the floating de-icers, he’ll apparently get bored and rip them out by the cord, leaving the tank to freeze. 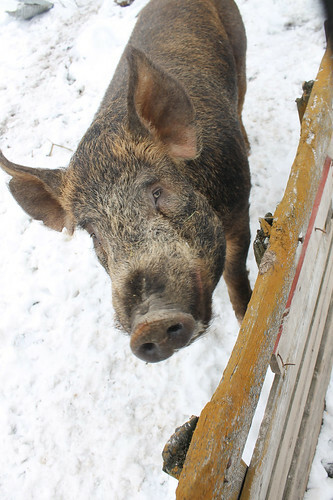 Speaking of which, he big dude here is Wayne’s Tamworth boar. I really liked that Wayne had two different breeds that I was interested in, Tamworth and Large Black. Both are said to be excellent grazers, but they look totally different from each other. The Tamworths were a bit smaller, but very well muscled. The LBH (large black hog) sow was quite skinny. Initially I was a bit alarmed by her shape, but Wayne explained that she had just weaned a litter of her own, along with most of a litter from his Berkshire sow, who was apparently not a great mother. The LBH had taken up the slack, nursing every piglet who wanted to eat, even though it took quite a toll on her physically. That extra nutrition showed up in her offspring too. In the picture below, the black pigs are all LBH x Tamworth, and the small red pigs are Berkshire x Tamworth. They are all the same age, except for the bigger red pigs, which are pure Tamworth, and a full month older. The LBH piglets are about to catch up to the older Tams, and leaving the small Berks in the dust. I’ve been interested in the LBH and similar “grazing” breeds of hog because the single biggest expense in raising pigs is the cost of feed. Wayne’s feeding regimen was very good to hear about. He feeds about 1lb of grain per day per hundredweight of animal. This goes for feeders as well as well as breeding stock. His hogs also get a few flakes of high-quality alfalfa hay per day, only as much as they’ll eat, they get cheaper grass hay to bed down in. In the summer, the pigs all live on fresh pasture, harvesting their own alfalfa. 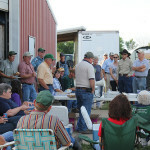 Wayne said he gets his feeder pigs up to market weight in 8 months, which is 2-3 months slower than a free-choice fed pig, but drastically cheaper. Thanks to Wayne for showing me around and answering all my questions. I learned a lot in the few hours I was there, and I’m now eagerly trolling craigslist looking for leads on some Large Blacks to start our pig herd with in the spring. 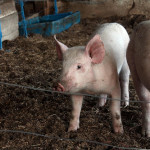 Interesting, it seems like the pig version of a grass-fed system: lower costs but it takes a bit longer. I wonder if having more pasture in the diet affects the pork’s health benefits the same way that grass-feeding works for ruminants? His alfalfa fields survive pigs? Don’t they just dig up the crowns? Curiousfarmer has permanent pasture there which is way more resistant to damage than alfalfa, but maybe Green Acres is running a strategy of grazing older alfalfa plantings? Out here pigs are such a low-margin business you’d need to do something like this to be profitable, otherwise you are squeezed between grain prices and middlemen. Still, they’d taste great. 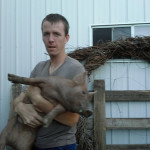 We just butchered a pastured pig that had a carcass weight of 222kg, which in pounds is really huge. So, when are the first pigs arriving? damn, 490lbs is a big pig. I don’t know if this is the type you had, but they look a lot like Large Black Hogs. I’ll probably wait for things to warm up a bit before I get any hogs. Maybe March? That ought to give me enough time to get a barn cleaned out and repaired enough to hold them.